My One Room Challenge office makeover is nearing the final week and there’s still so much to do! However, I know if I hadn’t committed to this series, the projects I’ve been wanting to do for over a year would still be on my to-list. Instead, I’ve been able to cross a few off, and that’s progress. Accountability really is the best motivation, isn’t it?! If you’ve been following along since the beginning of this challenge, then you know that so far I’ve organized my desk drawers, selected new light fixtures, and created a fabric pinboard. This past week I focused on organizing the bottom portion of my office closet and started an art project. 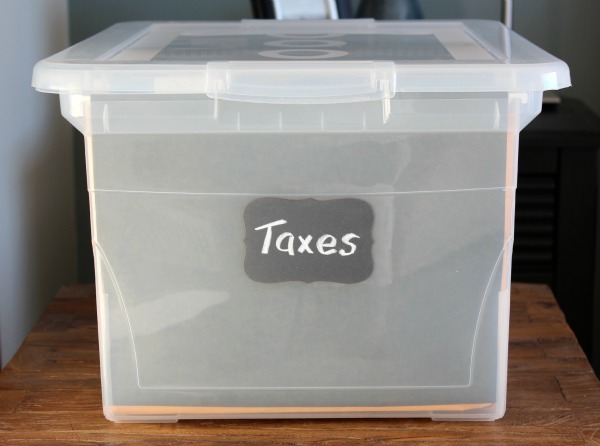 I hoped to find some decorative file boxes to replace the blue plastic ones, but it looks like my search will have to continue. In the meantime, I decided to swap out one of the blue containers for a clear plastic one I was using to store craft supplies in my basement storage room. For the label, I used a ready-made peel and stick chalkboard. To freshen up the file cabinet, I cleaned it really well, spray primed it, and gave it a couple coats (lightly sanding in between) of Benjamin Moore Decorator’s White (CC-20), which is the same paint colour I used for the closet last year. Originally my plan was to add a decorative detail, but I like how it simply blends into the closet. While I was digging around in the basement for my painting supplies, I found this old art canvas that was hung in our kitchen years ago. The scale is perfect for the wall beside my desk (opposite the pinboard), but the style is dated and the colours are all wrong. So far I only have a coat of primer on it, but I plan on using leftover paint in soft blues, greens, greys and whites to create an abstract piece. Wish me luck! That’s it for now. I’m crossing my fingers my chandelier shows up very soon. 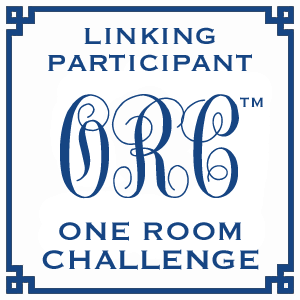 Be sure to check out the other One Room Challenge project updates for this week! Awesome closet! That may just inspire me to get cracking on my own office fix up! You should. We spend so much time in our offices. It’s so great to be more organized and have something pretty to look at every day. 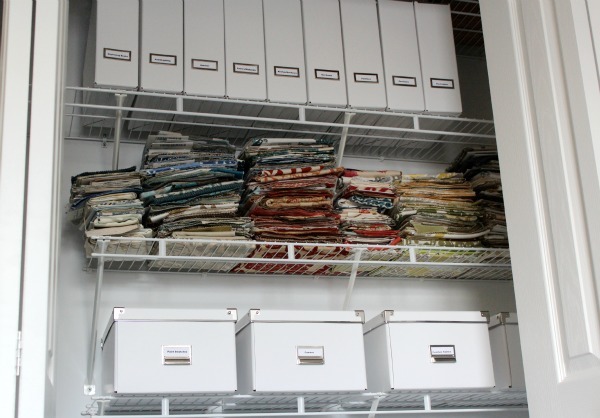 I love how organized the closet looks – and all the pretty fabrics in it as well. 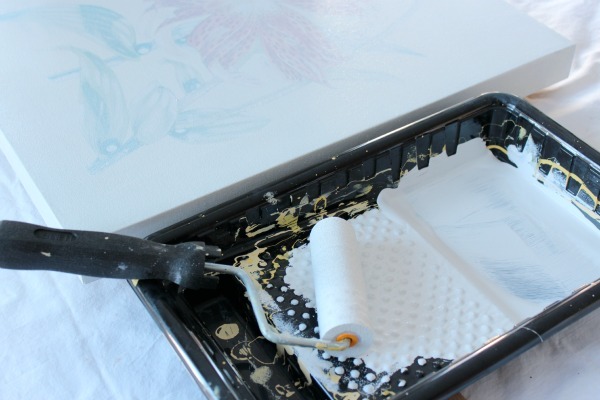 I’m very interested in staying tuned for the abstract art you are working on…. Thanks Dawn! Did you find your sources for fabric yet? 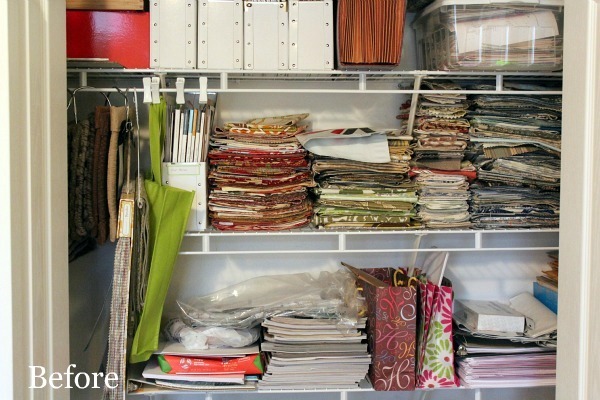 That closet looks wonderful Shauna, so organized and I’m sure that canvas is going to turn out great! That botanical is lovely! Can’t wait to see your office finale! 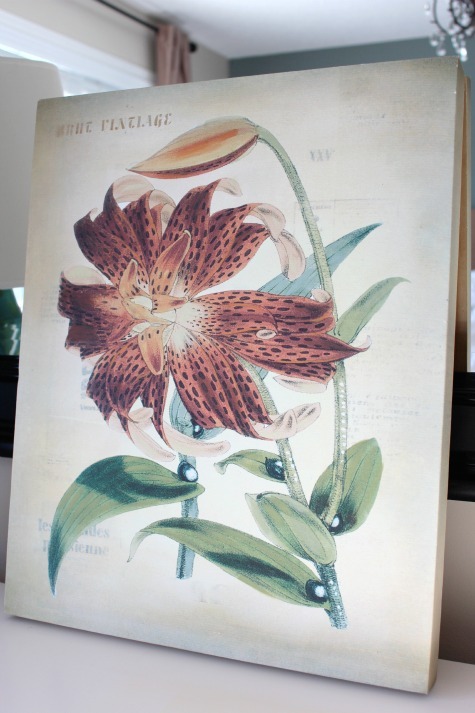 It is a lovely botanical, but I was tired of it (you know how that goes). Getting a makeover at the moment. Doesn’t it feel good to get things purged and straightened up? The room is really coming together and I look forward to seeing the final reveal next week. Oh my! What a difference! Loving all the white organizers. Wow! Such a great difference in your closet. Impressive. Can’t wait to see what you do with the art work! 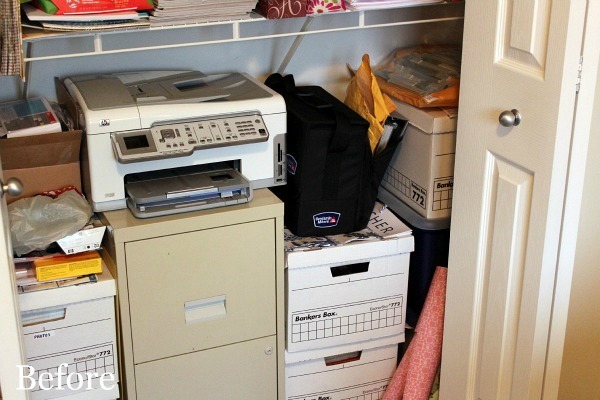 Love the organized look Shauna – I think your almost done! Can’t wait to see what you end up doing on that canvas! Is it possible to be excited to see more organizing? I love the closet! Can’t wait to see all of the together. Good luck this week. 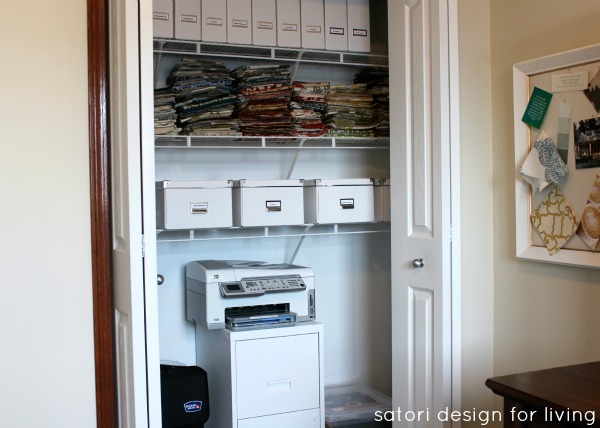 Love the closet makeover! And I can’t wait to see your new painting! I have to say, your before looked not too bad! But, you definitely improved it even more. Looks organized and makes my brain happy just to look at it. The filing cabinet looks much fresher with a coat of paint! WOW! Your closet looks great! I love all the white. I can’t believe we have days left! I can’t wait to see your finished space! Hmmm. Good for you! I’m a bit envious of our closet and can’t wait to see what you do with that canvas..